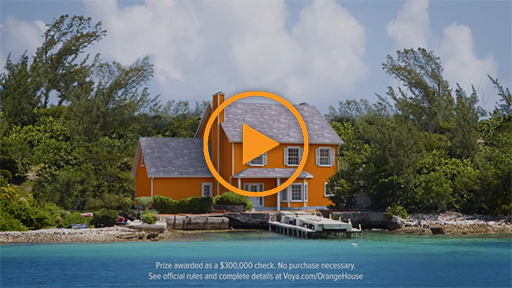 Voya Financial, Inc. (NYSE: VOYA), announced today the launch of its Orange House Sweepstakes™. The campaign will offer one winner1 the chance to take home $300,000 — with the hope that they apply the money toward the house they want in retirement. The sweepstakes also encourages all Americans to start building a solid foundation for retirement so they can achieve their goals. 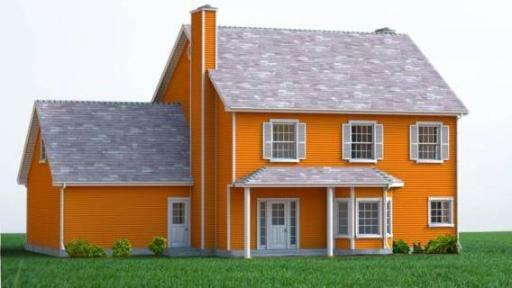 Those interested in entering the Orange House Sweepstakes™ must act soon — the deadline to participate is April 24, 2016, and there is no purchase necessary. 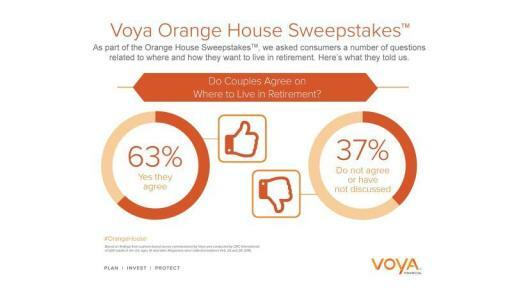 For more information on the program rules and details, visit Voya.com/OrangeHouse. 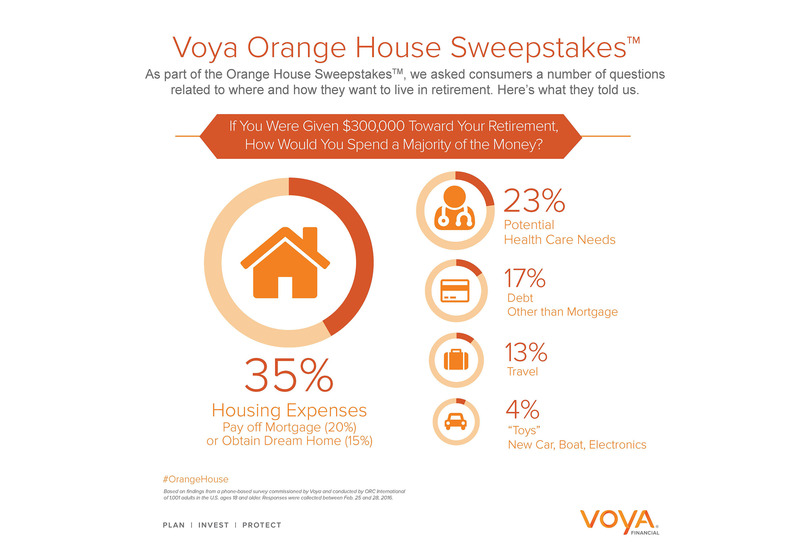 Voya recognizes that housing accounts for one of the largest categories of spending in retirement. According to industry research2, annual home-related expenses represent 43 percent of total spending for those ages 75 and older. Expenses include such things as mortgages, property taxes, insurance, rent, utilities, and costs for repairs, cleaning and maintenance. 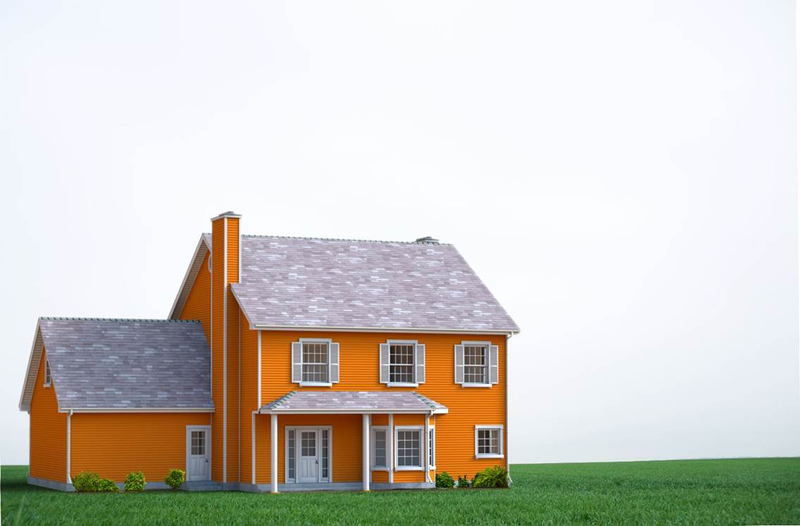 The Orange House Sweepstakes reminds everyone to start planning and organizing today so they can better address these needs when the time comes. There are many financial choices to make when planning the lifestyle and housing you want in retirement. 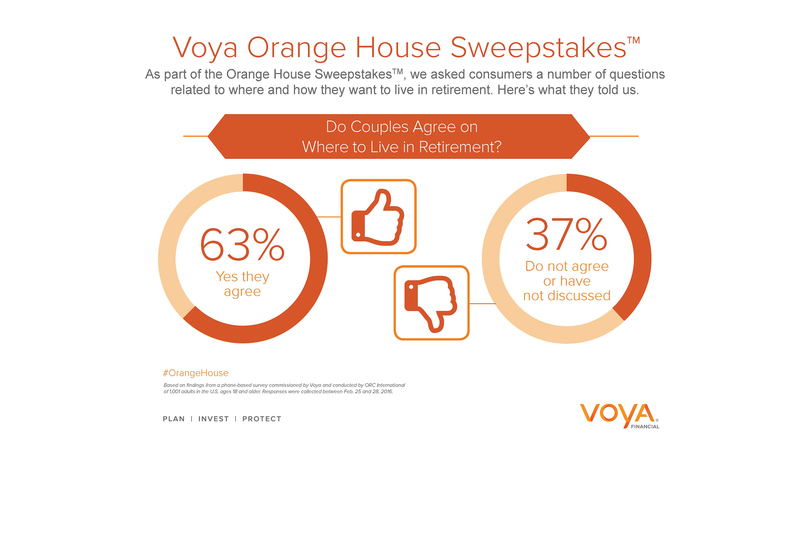 A new survey3 from Voya Financial found that if consumers received an unexpected $300,000 for their retirement, more than one-third (35%) would use it pay off their mortgage (20%) or buy their dream house (15%). Nearly one-quarter (23%) would save the money for future health care needs, while less than one-in-five (17%) would pay off non-mortgage debt. Fewer would use it for travel (13%) or to buy new “toys,” such as a car or boat (4%). Regardless of your priorities, the survey reinforced that planning is a necessary component for reaching one’s future goals. How would you spend a $300,000 windfall for your retirement? Do you plan to relocate or stay where you are when you retire? Do couples agree on where to live in retirement? Greatest Concerns: While housing will take up a significant portion of retirement income, health care costs weighed most heavily on the minds of respondents. More than four-in-ten (41%) said this was their biggest retirement worry, compared to those who were most concerned about housing expenses (15%). Homeownership: “The American Dream” includes owning a home in retirement. Among those who were not yet retired, a significant majority (85%) planned to own their home in retirement. A much smaller number (12%) expected to rent. Mortgage Payoff: Most homeowners with a mortgage were optimistic about paying off their loan prior to retirement. Among non-retirees who had an outstanding balance, eight-in-ten (80%) planned to pay off their debt compared to roughly one-in-five (19%) who expected to carry it into retirement. Interestingly, more than one-quarter (26%) of current retirees told us they still had an outstanding mortgage balance. Downsizing: Well over half (57%) told us they would remain relatively consistent in what they spend or save on housing in retirement. However, among those who did plan to adjust their housing budget, more than twice as many respondents (27%) expected to scale down to a cost-effective home versus those who would save up for their dream home (12%). Reaching Consensus: Many couples are on the same page when it comes to their ideal retirement lifestyle. Among those with a spouse or partner, almost two-thirds (63%) were in agreement on where to live, while roughly four-in-ten (37%) did not agree or had not discussed the topic. Surprisingly, a considerable number of couples who were already retired (23%) were not in agreement or had not talked about it. Factors for Moving: Relationships remain the key factor in deciding where individuals want to live in retirement. Nearly four-in-ten (38%) respondents said proximity to family and friends was the most important influence, compared to roughly one-in-ten (12%) who identified cost of living. While health care costs represented the biggest retirement concern, very few (6%) cited access to good or affordable health care as the primary factor. Relocation: When asked if they would move to a more ideal retirement location, half (50%) said they would relocate while the other half (49%) were satisfied with where they lived now. Among those who expected to move, more than one-third (35%) would prefer the coast, while three-in-ten (30%) wanted access to the great outdoors. Nearly one-quarter (23%) preferred a small town or suburb. Only one-in-ten (11%) wanted to live in a city. “Retirement goals are personal, and each individual or couple is on their own journey. The one constant, however, is to make sure you map out a plan to reach your destination,” added Linton. 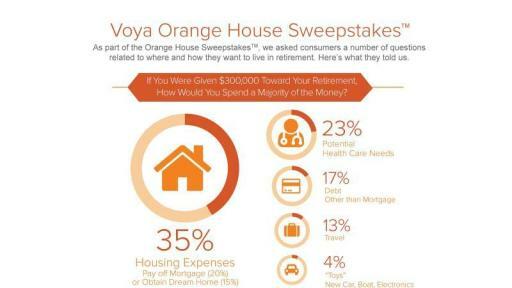 The Voya Orange House Sweepstakes is a reminder for everyone to think holistically about their retirement. This includes identifying short- and long-term goals, having conversations with your partner, and developing a plan to help you become ready. 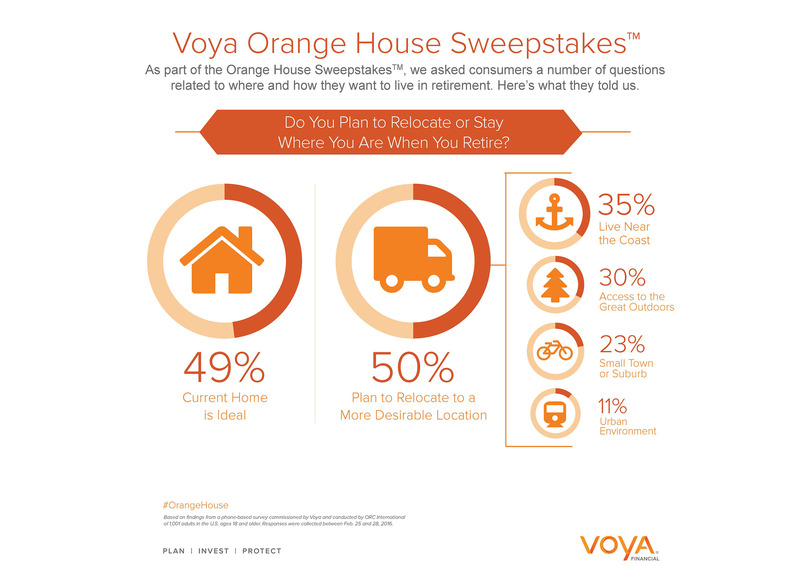 Voya offers retirement customers a suite of accessible, compelling and easy-to-use resources for retirement readiness planning — from field and phone-based financial professionals to a number of innovative digital planning capabilities, including Voya’s myOrangeMoney® experience and an online budget tool. These resources are available to help individuals with a broad range of activities, such as understanding retirement income needs, budgeting and protecting one’s financial security. 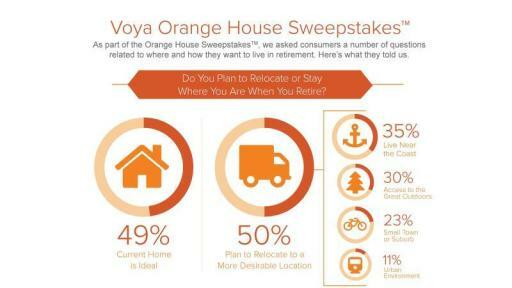 To learn more about the Voya survey, please visit http://go.voya.com/OrangeHouseSurvey. 1. Subject to complete terms and conditions, including U.S. citizenship/residency requirements. 2. September 2014 study “How Does Household Expenditure Change with Age for Older Americans,” from Employee Benefit Research Institute. 3. Based on findings from a phone-based survey commissioned by Voya and conducted by ORC International of 1,001 adults in the U.S. ages 18 and older. Responses were collected between Feb. 25 and 28, 2016. Voya Financial, Inc. (NYSE: VOYA), helps Americans plan, invest and protect their savings — to get ready to retire better. Serving the financial needs of approximately 13 million individual and institutional customers in the United States, Voya is a Fortune 500 company that had $11 billion in revenue in 2014. The company had $484 billion in total assets under management and administration as of June 30, 2015. With a clear mission to make a secure financial future possible — one person, one family, one institution at a time — Voya's vision is to be America's Retirement Company™. The company is equally committed to conducting business in a way that is socially, environmentally, economically and ethically responsible — Voya has been recognized as one of the World’s Most Ethical Companies, by the Ethisphere Institute, and as one of the Top Green Companies in the U.S., by Newsweek magazine. For more information, visit voya.com or view the company’s 2014 annual report. Follow Voya Financial on Facebook and Twitter @Voya.